Mesh is an excellent deterrent to would be intruders. The Taurus mesh fencing style has formed ‘V’ profiles which add rigidity and strength to each panel. Single Leaf Mesh Gates supplied by One Stop Fencing Products are available in heights from 1.2m to 2.4m and widths of 0.9m to 2.5m.Mesh gates are supplied in a PPC Green finish as standard. Mesh is an excellent deterrent to would be intruders. The Taurus mesh fencing style has formed ‘V’ profiles which add rigidity and strength to each panels. Taurus Mesh is welded at each intersection to add extra strength and upholds a very smart appearance to the public eye aswell as being vandal resistant. Mesh Gates supplied by One Stop Fencing Products online are all extremely robust and available in heights from 1.2m to 2.4m and widths of 0.9m to 2.5m. 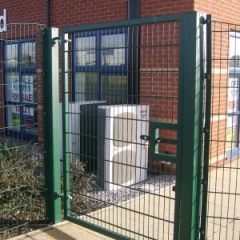 All Mesh gates are available with a galvanised and powder coated finish in PPC Green or Black as standard. Other colours arw available, please contact the store for price and availability.